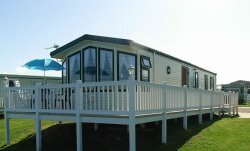 Luxury 3 Bedroom Caravan at Craig Tara Holiday Park with Full Wrap around Veranda (child safety gate)Sea View. Patio Furniture. 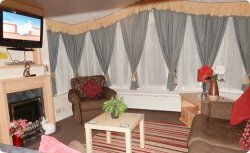 It is fully Double Glazed and has Gas Central Heating in all rooms. There is a separate WC and Shower room. Sleeping 6 in 3 bedrooms (one double and two twin) . The Lounge is exceptionally spacious and decorated with a modern stylish design. 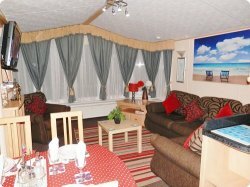 It is equipped with Wall mounted Flat Screen TV, DVD, CD and Free view. The Dining Area has free-standing Dining Table and upholstered dining chairs. The Master Bedroom has a Double Bed, full size wardrobe with drawers. There is also a portable colour TV. Twin Bedroom has Two Single Beds with wardrobe and drawers. 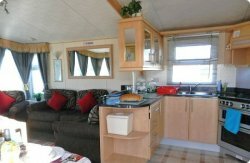 Second Twin Bedroom has Two Single Beds with wardrobe and drawers. Separate Shower Room and WC. Shower room has Power Shower with thermostatic controls. Wash hand basin. A vacuum cleaner is also provided. 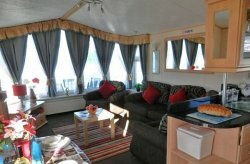 There is a Private Car Parking space at the rear of Holiday Home. A Fire Extinguisher and Smoke Alarm, CO Detector are provided for your safety. 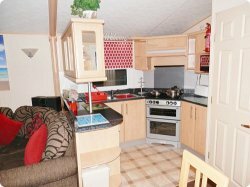 This is Actual Photographs of the Holiday Home They Are NOTCatalogue Photographs as seen on other web sites. Location: Less than 1 minute stroll to beachfront and 5 minute stroll to complex, shops etc.